Have you ever had a day or string of days that should have been relaxing turn into a day (or days) of endless running around? That was us over the weekend! With Matt in pre-production for his newest film and me trying to get my own stuff done the time slips by. 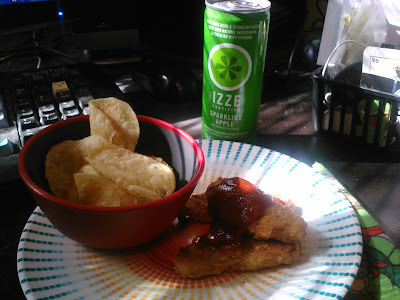 Matt's go to fast lunch I usually throw in the oven (I do not use a microwave - even faster if you do) is Gardein Seven Crispy Tenders. I happen to be allergic to two of the grains so I just serve them to Matt and usually grab myself a Luna bar, pineapple spears or a veggie burger on a Oroweat thin round with some Wholly Guacamole smeared on top. Serve it with your fave chips, french fries (Target has Ore Ida and Alexia brands - with vegan tot and fry options) or a simple salad with an organic bag mix and some olive oil + vinegar on the side. Get fancy and make different dipping sauces - I usually go for 2 parts ketchup to one pat Sriracha - mix and serve! Feeling like a taco or burrito option? Target has Mission tortillas, Amy's refried beans, salsa and organic chip options and again Wholly Guacamole in the mix! You can grab a veggie burger (many vegan options), thaw it out, crumble it up and fry it in a pan with a bit of olive oil and add it to your Mexican creation. Taco night can be easy, cheap and fast sticking to the basics of beans, salsa and crumbles. You can add greens if you wanted to - organic lettuce with Sicilia lime juice mixed in. Fry up corn tortillas or bake them into bowl shapes and make edible plates. How about a basic tofu scramble - tofu + spices, add salsa and black beans, wrap it up into a wheat tortillia and eat it up! The possibilities are endless! Wanting something sweet? 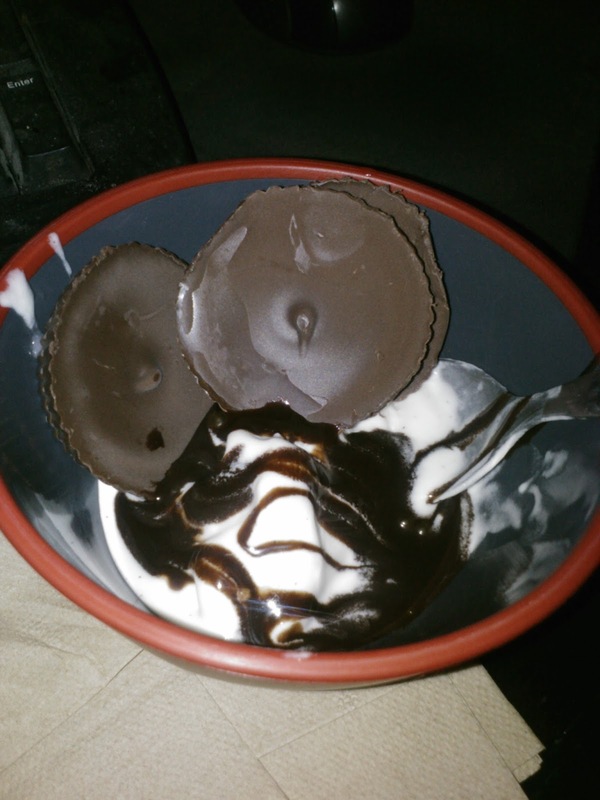 Justin's Dark Peanut Butter cups, no sugar added So Delicious vanilla ice cream and Hersey's syrup have you covered for a sweet sundae. If you do not dig on chocolate try mixing 1/4 cup peanut butter to a 1/2 cup of agave or maple syrup, heat it up on low heat in a small saucepan and pour it on top of your sundae. Maybe heat up some frozen berries with a bit of sweetener of your choice and make a pb&j sundae! Want to get more nutty? Smash some Nutter Butters and sprinkle it on top! Or crumbled up organic kids cereal is also a yummy option. Target has you covered for the basic fast meals that require basic cooking skills. Sure you can get more fancy with these things but when you are tired and worn out why bother? Thanks Target for having my tired back! When you are tired what is your go to meals? Hey - cereal counts! Share! I could live on pineapple spears! PB sundae what a great idea a hot pb sundae. right after some pineapple spears.